General histories listed on the page for Books about Angus & Kincardineshire, in particular Warden, vol. 4, pp. 56-67. 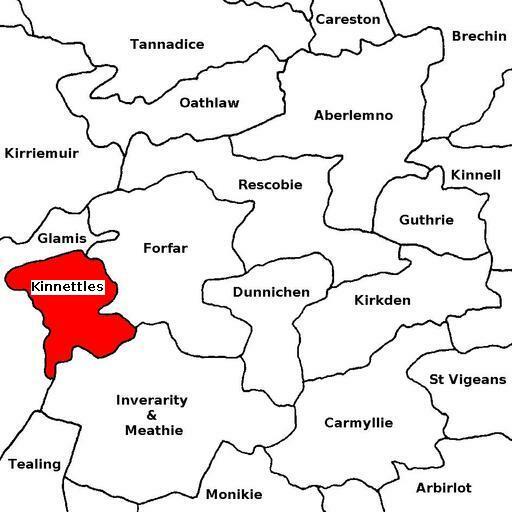 For the full range of maps of Kinnettles, see National Library's Maps. See Geograph.org: Kinnettles - recent photographs of Kinnettles. National Grid ref. NO4246. Located at National Grid ref. NO422466. Built 1812 by Samuel Bell. Now a private house. 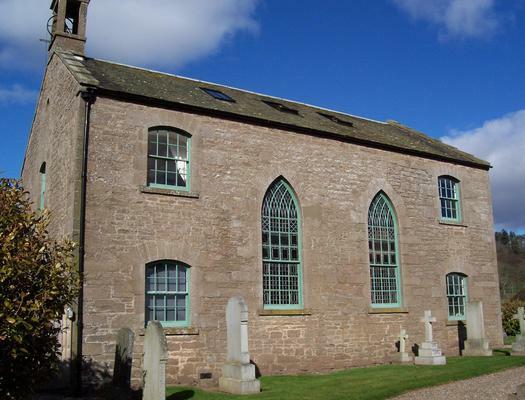 Above: the former Free Kirk, later United Free Kirk, at Kirkton of Kinnettles. It closed in 1919 and is now the Duncan Hall, named after Sir James Duncan of Kinnettles. John Lyon 1691-1716 M.A. St Andrews 1662; ord. 15 Sep 1665; adm. to Urr KKD 1666; outed there 1688; he said he filled vacancy here caused by Alexr (James?) Taylor from Apr 1691; d. aft. 19 Mar 1716; mar. Jean Murray; issue: Robt, Jane, Eliz. 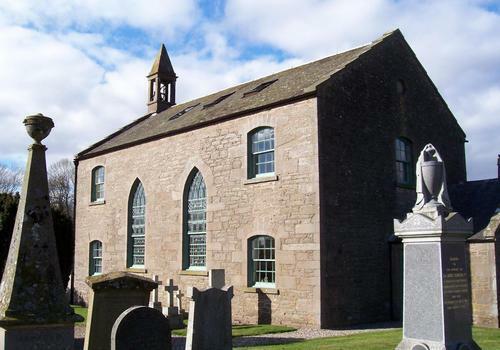 A fuzzy plan of interments and monumental inscriptions, with lair numbers and a few out-of-focus photographs of monuments in Kinnettles Kirkyard are at Kinnettles and District Heritage Group: Kirkyard. 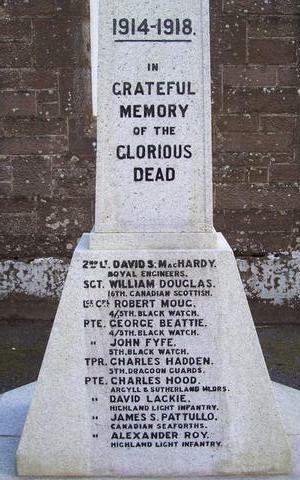 1840 Erected by JAMES RAE, farmer, North Mains of Kinnettles, in memory of his friends. The erector of this stone an elder of the parish died 19th April 1876, aged 79 years. In memory of ROBERT, who died in 1856. MARIANNE MacFARLANE, who died in 1879. JEANETTE WILSON, who died at Davos-Platz, Switzerland in 1890. Son and daughters of Rev. ROBERT TURNER, minister of Kinnettles. His wife MARIANNE MacFARLANE, died 1898. The said Rev. ROBERT TURNER, died at Dunoon in 1903. MARGARET FISHER, daughter of above died at Helensburgh in 1919. ELIZABETH TURNER, last surviving daughter died 18th August 1932. In the vault underneath lie the mortal remains of ANNE KEAN née NICOL born at Burnside Foffarty 21 Feb. 1802, died at the manse of Moonzie Fife 30 Dec. 1870. "Neither counted she her life dear." See also The Scottish War Memorials Project: Kinnettles. 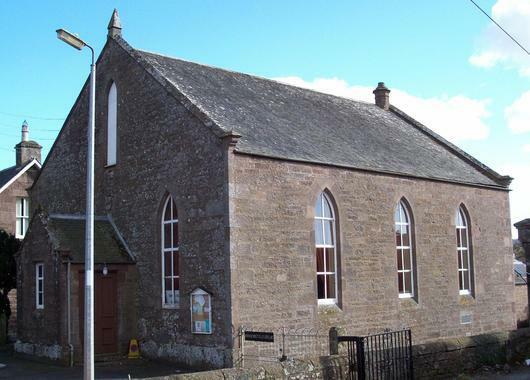 Kinnettles was in the Commissariot of St Andrews.